All Chuck Jones was trying to say is that Presidential-elect exaggeration is a killer when it involves jobs. It’s one thing for a candidate to inflate stuff like personal wealth. But when a President-elect tells the country he’s saved 1,100 jobs at a Midwestern manufacturing plant, and it’s really only 800, that hurts real human beings. Chuck Jones is president of the United Steelworkers (USW) Local Union 1999, which represents 1,330 workers at the Carrier furnace plant in Indianapolis. He’s the guy who had to tell them the bad news: 1,100 jobs hadn’t been saved. Only 800 workers would be spared, 730 union and 70 management. When President-elect Donald Trump announced 1,100 jobs saved, he included 300 research and development employees who Carrier never intended to move to Mexico. The members of USW Local 1999 had thought when President-elect Trump said 1,100 that only a small number of blue-collar jobs would be lost. In the end, though, it turned out nearly 600 workers would be out in the cold, almost half of the union members at the Carrier plant. Everyone was thankful that 730 jobs had been rescued. But the 1,100 figure had created false hope. When it was dashed, workers were devastated. It was worse than if the President-elect had given them no hope at all. This is important because the President-elect has made many promises to working people across this country. He said, for example, that he’d bring back manufacturing jobs from China, Mexico, Japan and elsewhere. He said he’d impose on companies like Carrier that ship factories and jobs out of the country a 35 percent tariff on the manufactured goods when they’re imported into the United States for sale. He promised tax incentives for manufacturers to build or expand factories in the United States. He pledged to create 25 million jobs. These are hope-builders for workers. They are pledges that must be kept. The President-elect’s pledges are particularly important to members of the USW. That’s because the USW is the largest manufacturing union in North America. It represents workers who forge steel and aluminum, build tires, mold glass, refine oil, make paper and cardboard, mine taconite and copper, and perform dozens of other highly skilled factory jobs crucial to the U.S. economy, like construct Carrier furnaces and grind and machine Rexnord ball bearings. Rexnord’s a plant 1.5 miles from Carrier that announced in October that it, too, intended to move to Mexico. 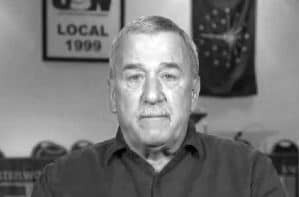 Unfortunately for USW members, Chuck’s experience with Carrier and Mexico is just one part of a long-running tragedy. The USW has been battling the ill-effects of bad trade and seeking relief from currency manipulation by countries like China for decades. The USW actually filed a lawsuit challenging the constitutionality of NAFTA. Unfortunately, the U.S. Supreme Court refused to hear it. The USW international has filed or participated in more than 50 trade cases in just the past decade. Almost all of these were done in partnership and cooperation with the employer companies. And most resulted in wins. In a couple of instances, the USW had to file by itself, with no help from the companies, whose positions were compromised because they had built plants in China. These cases are ridiculously expensive. But the union had to do it. It must pursue every avenue it can to protect members’ jobs against trade violators. Some Wall Street and Washington wonks who never got grease under a fingernail in their lives want to slam American factory workers as unproductive, overpaid and obsolete. This just isn’t the case. In fact, John P. Surma, the immediate past CEO of U.S. Steel, described his company’s unionized steelworkers as the most productive and efficient in the world. What’s really going on is some foreign countries are keeping their workers employed by manipulating their currency, subsidizing their manufacturers in ways that violate international trade law and absolving manufacturers of tax obligations, then exporting artificially cheap products. To sustain economic growth and employment, China continues to ramp up steel and aluminum production, even though the resulting excess capacity is roiling the entire world market. China is producing more steel and aluminum than the entire world needs, causing plummeting prices, bankruptcies, plant closures and massive layoffs from the United States, Canada and Mexico to India and the UK. There are more than 16,000 steelworkers out of work in the United States right now. Since 2000, 18 aluminum smelters have closed in the United States, permanently destroying thousands of good, family-supporting jobs, and leaving the country with only five operating. It is because China continues to break every rule it agreed to abide by when the United States granted it permanent normal trade relations (PNTR) status in 2001. And, clearly, NAFTA has not worked for workers either, with manufacturers like Carrier and Rexnord still planning to flee across the border. Neither did the free trade agreement with South Korea called KORUS. If the President-elect would like to repeal and replace all of those bad deals, the USW would like to work with him. The proposed Trans-Pacific Partnership free trade deal seems to be dead, and if the President-elect would like to start a new trade regime with workers and environmentalists and other interest groups at the table, not just corporate lobbyists, the USW would like to work with him to create fair trade that works for American workers and supports American manufacturing. The local union that Chuck Jones serves as president also represents workers at the Rexnord ball bearing plant. The President-elect called out Rexnord on Twitter for its plans to renounce Indiana for Mexico. The USW hopes the President-elect can persuade Rexnord to keep those 300 good jobs in Indianapolis. If not, the USW believes President-elect Trump should fulfill his pledge to impose a 35 percent tariff on any ball bearings Rexnord would plan to import into the United States from a new Mexican plant where workers would receive a total of $6 an hour in wages and benefits. On the campaign trail, the President-elect promised, “The forgotten men and women of our country will be forgotten no longer.” Working people across this country who heard that and his jobs and trade enforcement promises voted for him on the belief that he’d come through for them. Those hopes must not become false hopes. Those promises must be kept.